Growth rate Slow growing. A medium size tree with horizontal branching. 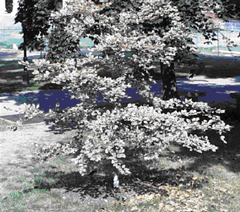 It is a shorter selection of the European Beech. Foliage Purple leaves variegated with a rose and white edge . Flowers Inconspicuous flower that blooms in the spring. Bark Smooth and gray in color . Landscape value The Tricolor Beech Tree purple foliage and horizontal branching add texture and variation to the landscape. It will grow in partial shade or full sun and tolerate clay soils and a pH of 6.8 to 7.8. Insects and diseases No major insect problems, but it is susceptible to powdery mildew.